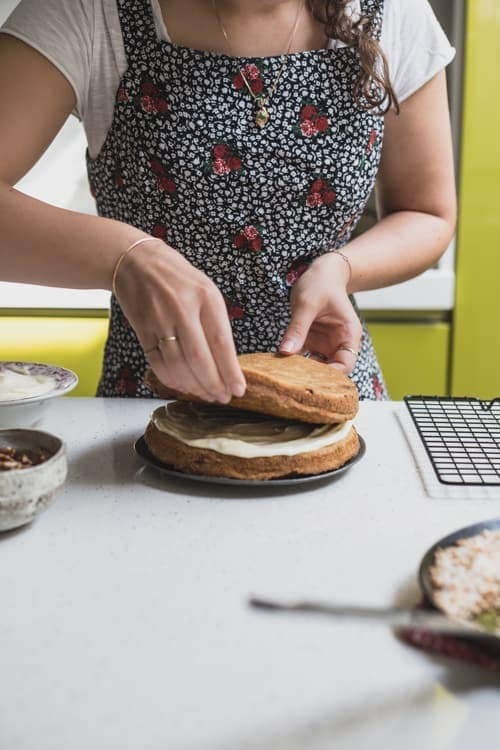 Now that I’ve broken the metaphorical cake-seal on the blog in my last post, it seems that the floodgates have opened and all I’m making is cake. There’s this pumpkiny one (because I had yet to make a pumpkin recipe this season), a maple pecan one from Linda Lomelino’s NEWLY TRANSLATED CAKE BOOK!!!! 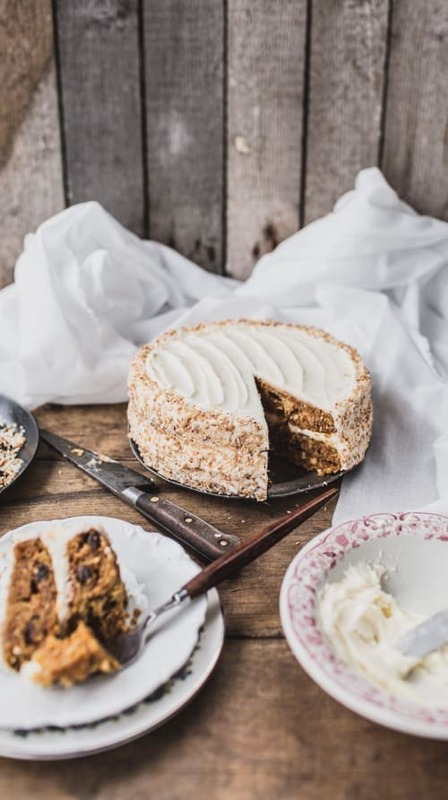 (coming soon…) AND this carrot cake I made for Design Sponge (piccies below). It’s been advantageous for me because I usually get what I call #cakerage during these cake baking sessions. It’s always all fine up until the frosting time. Then I break down and want to give up and eat the cake with my hands, animal-style. I did get…a bit angry…maybe…when the frosting for my carrot cake starting melting after the sun came out to say hello 😐 ugh of course. Then I learned that if you put desiccated coconut on the edges of cakes it doesn’t matter if it’s messy as heck cos nooo one will knoooow shhhhh. The whole process went a lot smoother for subsequent cakes so I have a bit less hate in my heart for making layer cakes now! 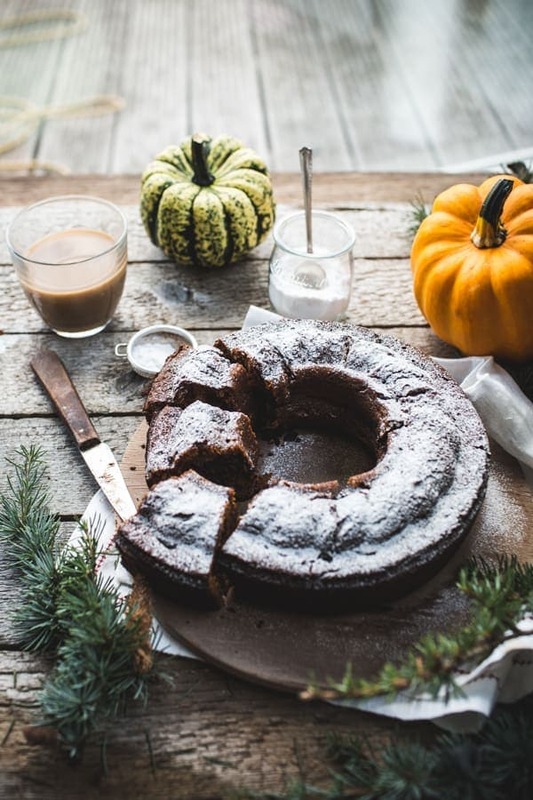 I made this Chocolate chip, Pumpkin and Rye cake for the GB chefs blog so if you want to surf the cake wave with me, stop over there to check out the recipe – or just look at the snaps here and feel all cosy and autumnal. Then go get yoself some hot chocolate just because. Omg so much delicious cake! I totally agree, sometimes a bit of coconut or whatever is what you need to smooth off those rough edges in frosting 😀 The rye cake looks wonderful too! Heat and frosting don’t go well together so I get you frustration! They all look really lovely. And you broke the news to me that Linda’s cake has been translated. Yey! Oh Izzy I just love your pictures!! I’ve had incidents as well with two layer cakes where, since it didn’t really fit perfectly upright in my fridge, the top layer decided to slide off the cake in the middle of the night right before I had to take it to a party! joyous. So I feel your pain. This is wonderful! I have been a fan of your blog forever, and I used your Pomegranate Salt recipe from last december in my latest (first & only) post; I made White chocolate and Pomegranate Salt covered popcorn! I gave you credit and gave a link to your blog, hope you don’t mind. Oh my gosh. This is my first time on your blog and I LOVE it. This cake looks amazing and your photos are just gorgeous. Congrats on the book launch as well! 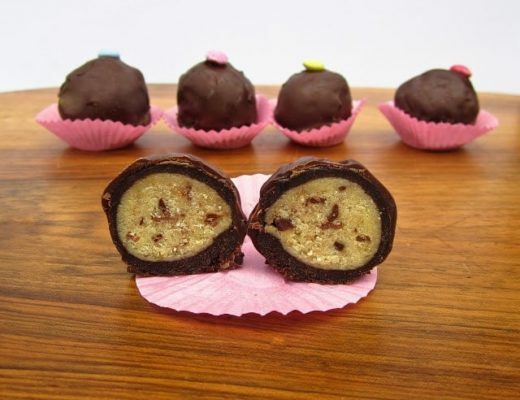 Cakerage or not, these look absolutely amazing! RYE bundt cake? I’m so intrigued. I feel like rye and pumpkin will go really well together and then BLAM chocolate chips and I’m all over this. Oh what’s that, you knew they would be good together? And you’re saying durr? Touché Hossack. Touché. My mouth is literally drooling how do you make everything so pretty??? Your cake looks fabulous, coconut or not. I’ve been known to succumb to cage rage too…. Both cakes are absolutely awesome for fall! Gorgeous photos too!! This looks delicious! Thanks Izy for the inspiration! Omg cakerage is my bestest friend ever (read: worstest enemy aghhhhh). I don’t know how many times I ruined a cake by just sticking my hand straight into it and taking out a big chunk to eat. #kidding #notkidding this cake looks amaaaaazing girl! I find that baking comes in spurts for me. I either want to roll out dough and measure out baking powder all day long, or I never want to see another speck of flour, ever again. So I’m not surprised. These look great! Question – when making recipes in small pans for photography and recipe development, do you also make another one in a regular size to get the measurements accurately? Or do you just do the math and assume it’ll work? I have never been great about decorating cakes. I’ll keep the coconut trick in my back pocket for the next time I need it! 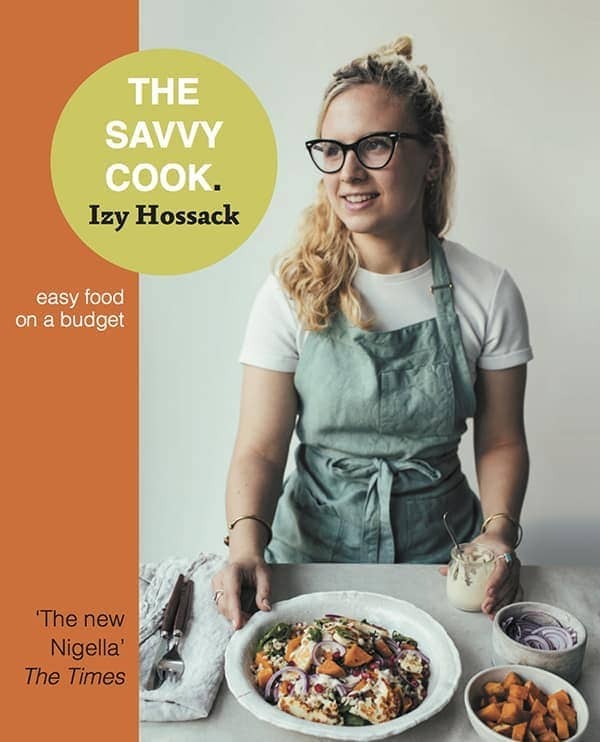 As a confirmed carrot-cake-aholic, I just want to say how awesome this recipe is – in fact all your recipes just make me want to run to the kitchen and start baking. Thank you so much! Every single photo is absolutely gorgeous. You’re such a talented cake maker! I can’t get over it. Simply perfect. And I love the sets for these pictures, too! SO inspiring. Oh my I just made your chocolate rye pumpkin cake and it is SO GOOD!! So moist! Amazing, thank you! Looove these pics, Izy! 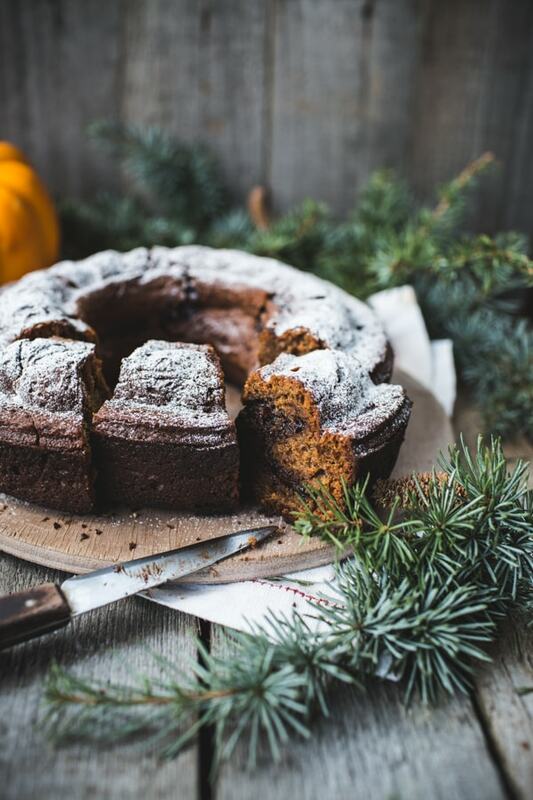 And that cake is pure autumn heaven! Also, Linda’s book is just bloody genius. Have it in Swedish and have loved it madly. omg YES TO CAKE RAGE. These are such stunners though 🙂 I’m glad they survived! I love all of these cakes. The carrot cake looks delicious. I have only this week come across your food blog and I already love it so much! I have been going through most of your recipes already (in particular the dessert/sweet ones), even all the way back to your first post (I like to look at good bloggers’ first post as I’m practically new to foodblogging and I just want to see where you all started, hihi!). I really really like your photos, so you are gonna be another one of the blogs I follow and read every day! Thanks for this beautiful blog and being an example! 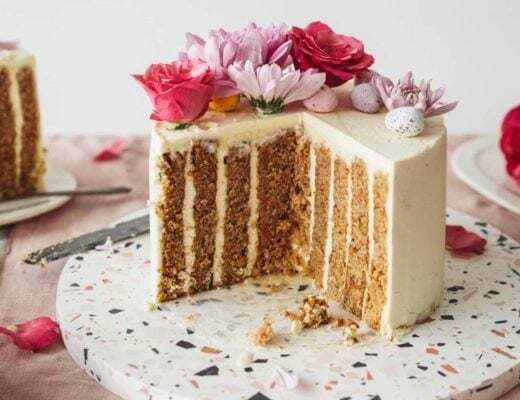 Love pumpkin cakes, especially if they are as pretty as this one! I just posted one with pistachio and ricotta, and this is next on my must-try list! Finally found a perfect desert for thanksgiving. . I should try making this one.